Friday, February 26, 1910 to Monday, March 8, 2010: Still in Tucson and mom is continuing to recover from her stroke. She has improved enough to return to Crossroads, the adult care home she has been living at for the past three years. All in all, a positive outcome. On one of our visits this week mom decided to dress up a bit and Kit found an appropriate hat to top it all off! 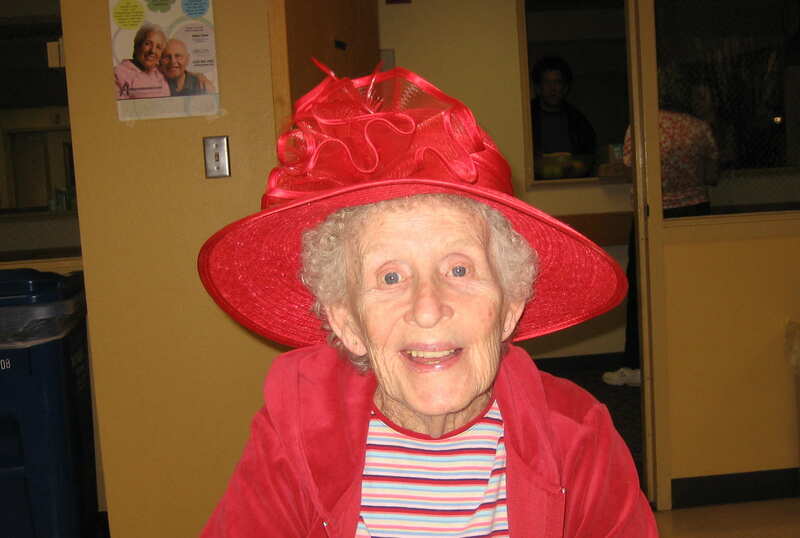 Nice hat…..she looks like she could be the Queen Mother of The Red Hat Society of Crossroads Adult Care Home. The weather, for the most part has been great during our stay. Day temps in the 70’s and down to the 40’s overnight. It only rained one day and all the locals were ecstatic! Rain in the desert is a cause for celebration. 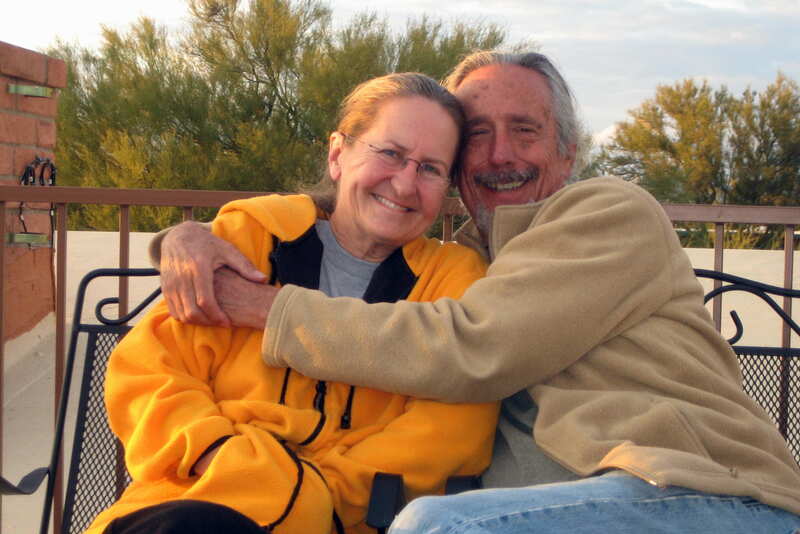 While traveling in the southwest, Kit and I shop at our favorite grocery store…..Trader Joes. It is a regional chain with uniquely branded products in addition to fresh produce, local beer and quality wine. And unlike some of the other “Boutique Grocery Stores” Trader Joe’s is not very expensive. Now we hear that Trader Joe’s may be coming to Portland, Maine!!!!! If true we can enjoy the same great products at home as well. Our favorites are Trader Joe’s Granola Cereal, Joe-Joe Cookies, Garlic & Cheese Bread, Cinnamon Graham Crackers and Trader Joe’s Dark Beer. There are additional stores we like out here as well. Savers, which is a re-sale shop with nice stuff and benefits Big Brothers-Big Sisters organization, Bookman’s Used Book Store and the local outfitter Summit Hut. 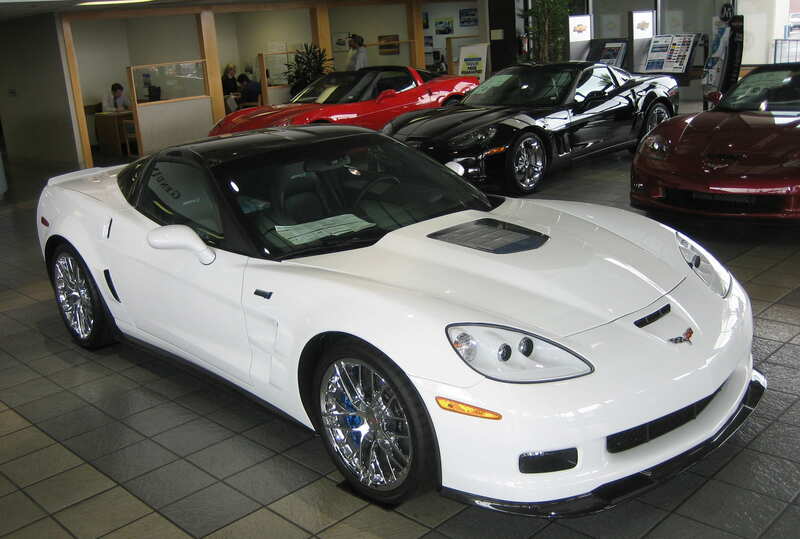 It’s a $122,000.00, 638 horsepower, Corvette ZR-1…..and they had two for sale! Being a car nut I spent considerable time drooling over this baby. Also note the line of “average” Corvettes in the background. Who says there’s no money in the desert? As I mentioned previously, Dewey and Bea’s neighbor is a Hispanic fella from Magdalena, Mexico. In addition to all his other accomplishments he is an incredible gardener. His large back yard is planted with an unbelievable array of vegetables and fruit bearing trees. Although his name is Manual everyone calls him “Manny” because he shares his “manny” oranges, tangelos and grapefruit with his neighbors. Being “Winter Neighbors” Manny shared his bountiful harvest with us as well. One of the days while in Tucson, Kit wanted to have a “Kit Day” and since Bea was working Dewey and I decided to do a little hiking in the mountains. 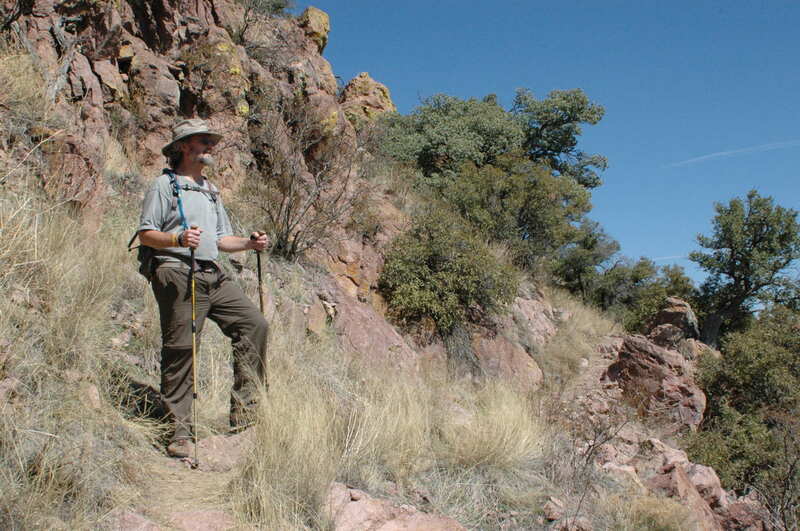 He suggested a trail that led to the summit of Anascosa Peak in the Coronado National Forest. Dewey, accompanied by Bea and the pup’s had enjoyed this hike previously and he was anxious to show it to me…..so off we went. Driving toward the trailhead on a narrow dirt road we came to a line of Hispanic Folks sitting by the roadside. As we got closer we noticed their hands were cuffed behind them with plastic zip-ties. There was a Border Patrol officer on horseback guarding them while apparently waiting for a van to transport them. It was a surreal sight; all the illegal’s looked frightened and confused and the agent looked majestic atop this huge horse. During our two years of traveling about the southwest that is the first time we witnessed a Border Patrol apprehension. Our tax dollars at work! Arriving at the trailhead mid morning we set off. The trail was very well designed and maintained. It immediately started to ascend the mountain by the way of numerous well placed switchbacks. After a few miles we caught sight of the peak and the fire tower that sits upon it, yep still have some more climbing to go. The mountain range on the horizon is in Mexico. 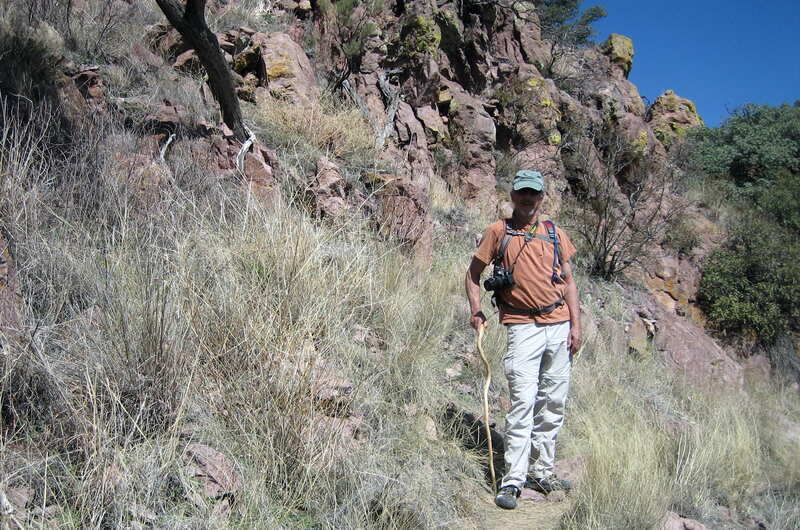 In fact while climbing up I received a text message on my cell phone that said “Welcome to Mexico, to make a call…….” I guess the closest cell tower to the summit of Atascosa Mountain is in Mexico. The fire tower was in remarkable shape considering it isn’t being used by the government anymore. Sine it was windy at the top we took shelter inside and enjoyed lunch and the views. 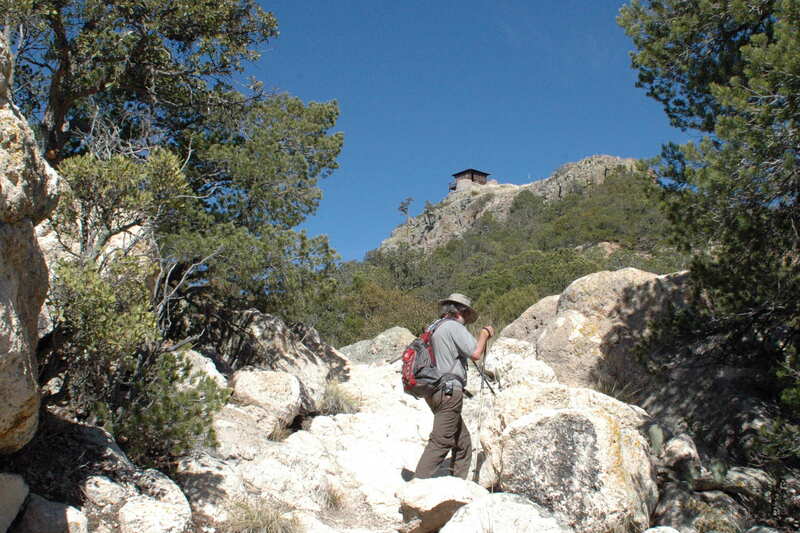 The fire tower, and the trail leading to it, is maintained by the local hiking club. It is outfitted so one can stay overnight and contains two beds, a woodstove, chairs, a table and various storage cabinets; some of which contain canned and dehydrated foods. In addition there is a “visitor’s log” containing notes and names of all who made it to the summit. Hanging on the walls are copies of old newspaper clippings about the very controversial author, Edward Abbey. Abbey, the “Henry David Thoreau of the American West” pulled a tour in this very fire tower as a lookout for the US Forest Service in 1968. While spending long and lonely days looking for smoke, Abbey had plenty of time to muse and develop his radical opinions. Excerpts from his daily journal while on duty in the fire tower are posted on the walls. Abbey went on to write many books; one of the most famous was “The Monkey Wrench Gang” which inspired the radical environmental movement. I would have loved to spend far more time up on the summit but the day was growing late so off we went. During our hike down the mountain I spotted something brightly colored off the trail. Going to investigate I found what appeared to be an illegal alien camp. There was discarded clothing, blankets, discarded cigarette packs, empty cans of beans and old water bottles and all the labels were in Spanish. Returning to the truck Dewey decided to take the Ruby Loop back to the highway. This 25 mile dirt road meanders through the Coronado National Forest and goes by the ghost towns of Ruby, Oro Blanco and several abandoned mining camps. Since it was getting late we didn’t stop but will one day have to return and explore these sites. Back at the highway and famished we stopped at The Cow Palace Restaurant in Arivaca. I enjoyed the best hamburger I’ve had in quite a while. Apparently The Cow Palace is the place to be for the retired rancher crowd. Boots and cowboy hats were in abundance and there was a piano player entertaining the diners. And what do you suppose they had hanging on the wall? Nope, not a stuffed bull’s head, but the head of a moose…..honest! 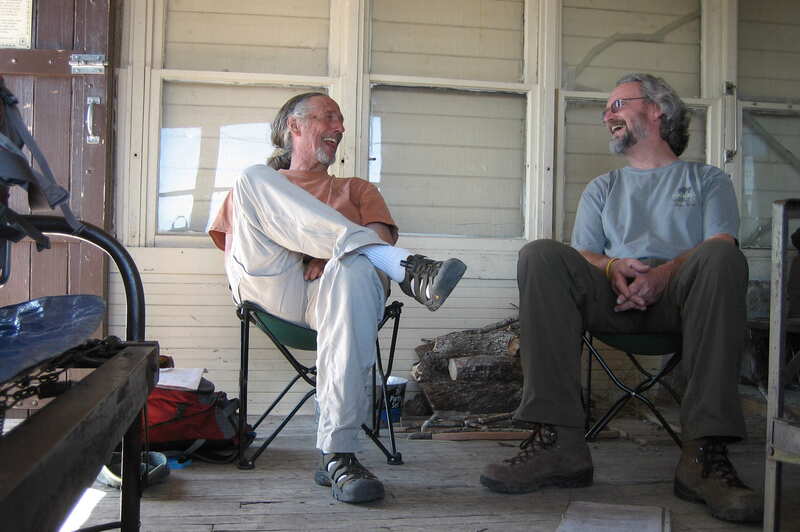 A perfect end to a great day and a great hike…..Dewey really knows how to pick them. Monday, March 8, 2010: Woke early, made coffee and decided to work on the journal. But first I signed onto the internet to check the weather, news and stock reports. In Tucson at 0600 it is overcast and the temperature is 51 degrees. Smugly I checked the weather back home in Maine. 54 degrees—–Yicks! In a few years, with continued global warming, we should have a tropical paradise back home in Crabapple Cove. Reluctantly we parted company with Dewey, Bea, mom and Dan and headed out for the long trek home. When leaving Tucson we generally stop by the local RV center to dump the holding tanks, fill up with propane and add water to the storage tank. 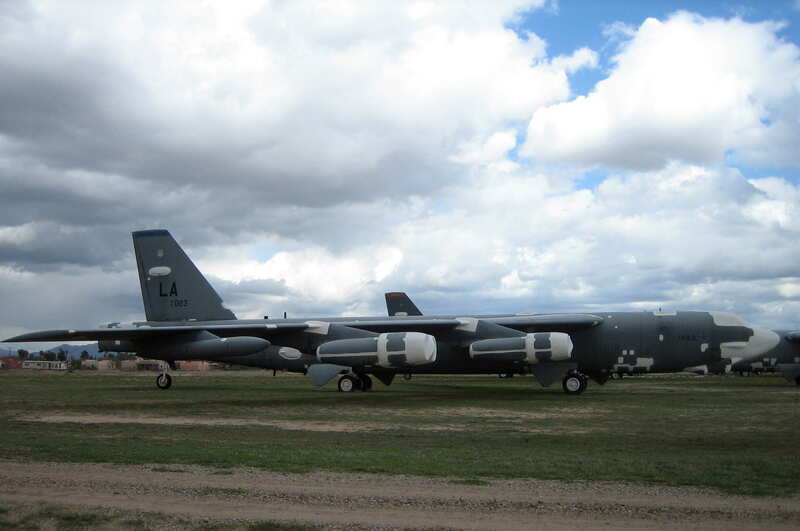 This time we decided to stop by Davis-Monthan Air Force Base to take care of all that. Since it was getting late in the day and it looked like a storm was brewing we decided to stay overnight at the base campground. Unfortunately they were full of fellow snowbirds so we were shuttled off to overflow. 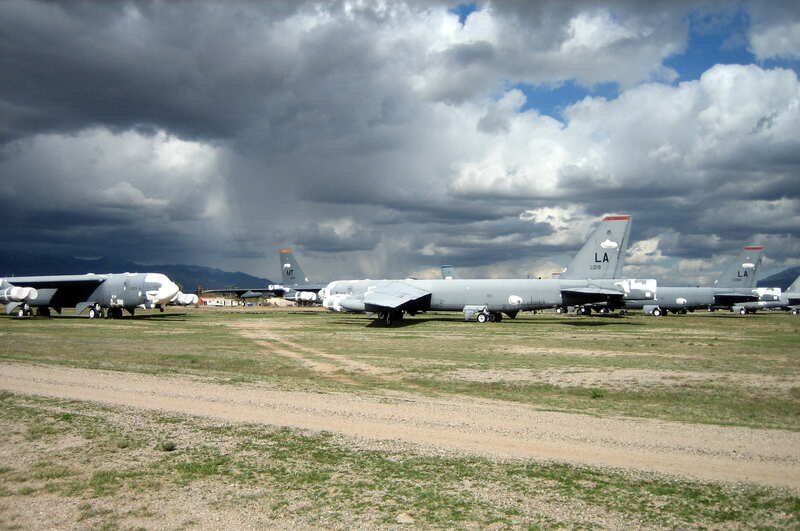 It is the famous “Bone-yard” where all the surplus US military, and some civilian, airplanes are stored. Officially it is called AMARG (Aerospace Maintenance and Regeneration Group). The area covers 2,600 acres of desert floor and contains over 4,400 planes and spacecraft. This base was selected back in the 1940’s as an airplane storage facility due to the warm dry environment and the very hard subsoil called “caliche”. There is no paved area for the planes to park on…..just a hard and flat desert floor. 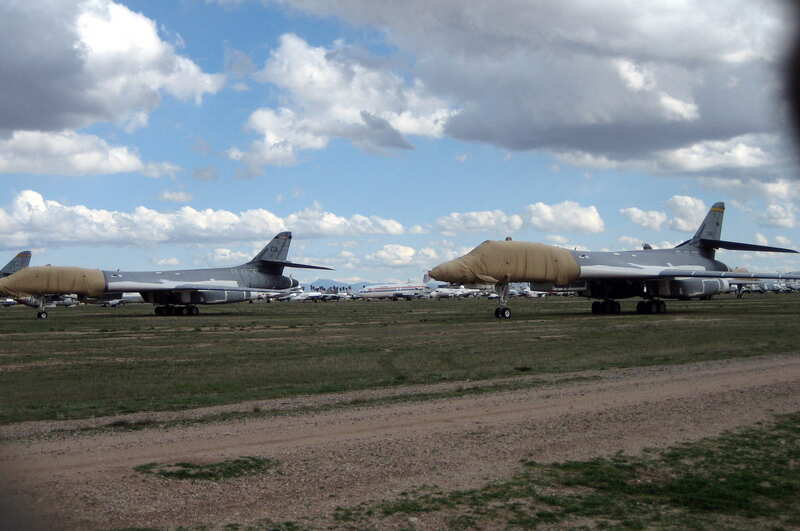 Some of the mothballed planes are sold and others become candidates for spare parts. There are intact planes and bits of planes stored everywhere. Quite a site, I took a long walk around the fence perimeter, stopping often to take pictures. There was even a gaggle of P-3 Orion Maritime Patrol aircraft…..the kind that used to fly above our house in Brunswick. The feds told us that our airbase had to close because the threat of submarine invasion to the city of Portland, Maine was minimal. So some of the planes went to Jacksonville, Florida; apparently a more favorable target. 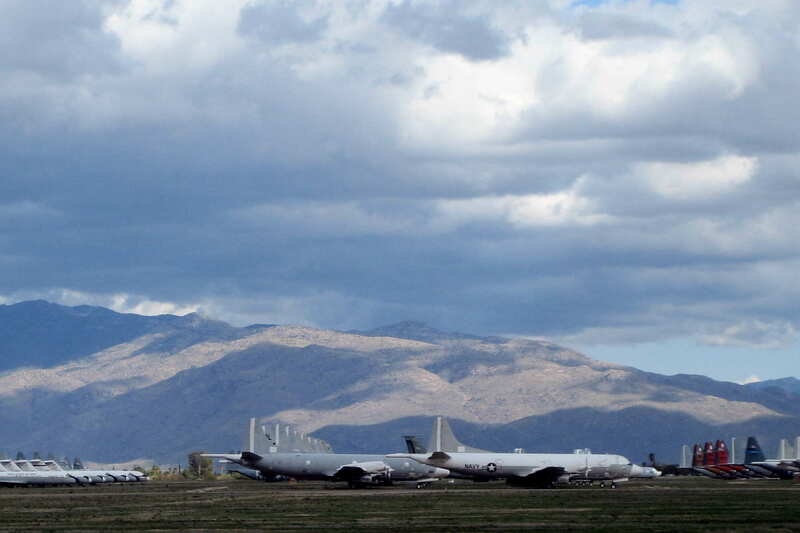 And the rest of the planes came here because I’m sure that Naval Intelligence (no comment) has uncovered evidence of submarine activity lurking beneath the desert floor in Arizona. Personally I believe the Navy closed our base and sent the planes to Florida because that is where all the retired Admirals go to retire. They have to retire there…..it’s a Navy Regulation, or something. Tuesday, March 9, 2010: Underway early and heading east on I-10. Shortly, two Arizona Highway Patrol cruisers pulled up alongside, motioned for me to roll down my window, and asked us to increase speed a little. Weird since the speed limit was 65 and I was in the right lane doing 55. Then they stayed right alongside paralleling my increase in speed to 65. After a few minutes the both turned on their lights, slowed abruptly and pulled off the freeway. Not sure what that was all about. Traveled into New Mexico mid-day and went through Lordsburg and Deming. Since there was not much to see in this part of New Mexico we kept on trucking toward El Paso, Texas. Entering the outskirts of the city we encountered a traffic jam…..not unusual for late afternoon in a large city. However this one was complicated by a huge wreck involving tractor trailer rigs and other vehicles. What a mess…..both lanes of the interstate were open but the traffic was slowed by all the rubber necking. Clearing El Paso it was getting late so we looked for a flat spot to park for the night. We pulled into a Flying J Truck Stop and settled in alongside a large motor home. Another large motor home pulled in after dark and we felt like a “Weenie Trailer Sandwich”. Taking a walk around the parking area, I discovered all the RV rigs parking for the night were from Quebec, Canada. It felt like Old Orchard Beach back home….except for the absence of French Fries, Speedos and Canadian Sandals. The Flying J Truck Stop chain is a great place to RON (Remain Over Night for you non military folks). 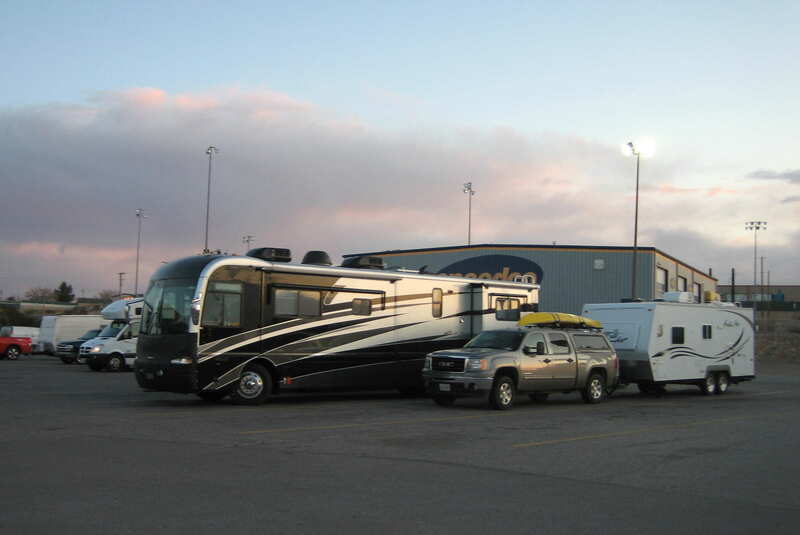 It welcomes RV’s, provides flat and secure parking and features a store, restaurant, fuel and dump stations. At some of the Flying J’s the RV fuel lanes allow you to fill the RV with gas while dumping the tanks…..at the same time! A convenient but minimal place to campout but the price is right…..doesn’t cost a thing! Kit’s Corner: So, as many of you know, Bill is “spelling challenged”. Fortunately, he has a sense of humor about it. I usually check the spelling and grammar prior to sending out the journal. I checked this one, corrected all but one error. Let’s see who can find it first! Seriously, he has been doing a great job chronicling our travels. In our upcoming “no go” years, we will have some good reading material to discuss and share a few laughs over. Hi guys! Re global warming. Although last weekend was in the high 60’s here, today (March 26th) we had some snow flurries this AM and tonight it is going to be in the TEENS!! Next week rainy, windy and in the 40’s for the most part. I think it must be because it’s about time for all the “snowbirds” to be returning home that’s causing this phenomenon!! We leave today for 4 days in Saratoga, NY for a woodturners “thing”. Hi there! 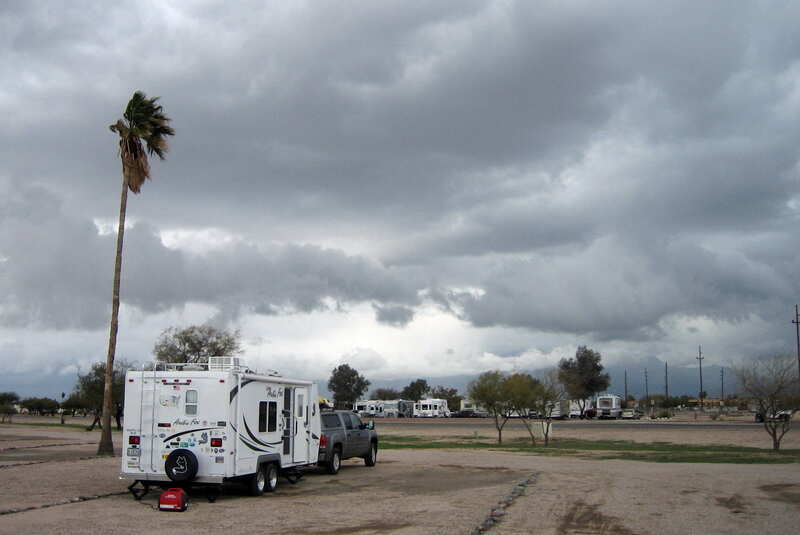 We have spent a number of nights in Deming at “Littel Vineyard” campground….on our way to Tucson, on our way from Tucson to Albuquerque, left the coach there while we went by car to Albuquerque to visit my old roommate and her hubby, and again when we went back to get the coach. Nice little town with a great diner! Pups needs no apostrophe…it’s plural not possessive. But that’s a grammer error, not spelling (LOL). Guess Nancy found the spelling error. Now we will all be double-checking each journal…ha-ha. Looking forward to all being at one lake or the other again soon. I really enjoy what you write here, very refreshing and intelligent. One problem though, I’m running Firefox on Linux and parts of your layout pieces are a little misaligned. I realize it’s not a popular setup, but it’s still something to watch out for. Just shooting you a heads up.